This has got to be one of the most overlooked underground hip-hop classics to ever be released. Which is quite a shame, since "The Album" is as sonically original as Company Flow's "Funcrusher Plus", which was also released in 1997. Both of these albums were amongst the most abstract hip-hop albums to hit the scene, which brought avant-garde experimentalism to hip-hop (i.e. Definitive Jux, Anticon). Lets start with the extraordinary cast. Lyrics Born (a.k.a. Asia Born, Tom Shimura), originally born in Tokyo, then moved to Berkeley, California; was the founder of the Quannum/SoleSides Records collective in 1992. DJ Shadow, also co-founder of SoleSides Records, was fresh off of his critically acclaimed 1996 debut, "Endtroducing...", and ready to turn hip-hop heads on their sides. Lateef the Truth Speaker, a new remarkable talent, made his debut on "The Album". Contrary to popular belief, this album is not completely produced by DJ Shadow. In fact, Shadow only produces 4 tracks on the album. Label mate Chief Excel (Blackalicious) produces 2 tracks. Lyrics Born takes on the bulk of the production; coming to the table with 7 tracks. The highlight of the album is up for debate. The production brought forth is unbelievable, which sounds extremely fresh, even by today's standards. But one thing that Big Juss and El-P (from Company Flow) did not possess, are lyrical flows on the unique level of Lyrics Born and Lateef. Lyrics Born gives a whole new meaning to the idea of breath control. His perfectly annunciated flow is so fluid, it's almost baffling. Lateef, on the other hand, is quite a bit different. His flow is more menacing and outspoken, although very unique and coherent. The idea of your average hip-hop formula is completely pulverized here, making way for some truly adventurous material. Moving on to the originality claims...The first cut "Latyrx" presents the most riveting production on the record. Lyrics Born and Lateef each recorded their verses separately. Each rap was split into their own audio channels (left/right). Since they are not interacting with each other lyrically, their raps are nearly impossible to comprehend, which doesn't really matter. Their flows mixed with the music creates a sonic texture of sounds that is utterly captivating. That's the most experimental track on the album, which turns out to be a nice choice since the album is filled with tons of variety. The album drives along through earthy trip-hop beats, ambient synth textures, as well as some jazz, funk and dancehall cuts. There wasn't anyone in hip-hop progressively using electronics the way these guys were. "Say That" is a welcomed change from the first cut, blending trip-hop and electronics well once again. 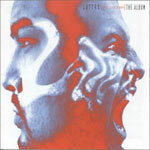 "The Quickening (The Wreckoning, Part II)" by Lateef, is one killer track. His flow is captivatingly sweet, and since he raps alone here, it's easy to focus on him. Also similar to the previous cut, "Balcony Beach" features Lyrics Born, which is my favorite track as of now. The beat/rhythm is actually quite minimal, featuring soulful singing by Joyo Velarde. Lyrics Born's flow is real lazy and intoxicating; I love it. "Live at 90.3 '94" featuring John Tchicai and Free Association boasts some killer freestyle verses (which is more than I can say for the sound quality). "The Muzapper's Mix: Aim for the Flickering Flame/Rankin' No. 1" pushes the envelope nicely with another solid jam. Track 8, "Bad News", kicks off a funky set. It features a soothing funky piano loop and drum beat that backs Lateef's story rhymes quite nicely. The next cut, "Off (With) Their Heads (Be Prompt)" featuring Lyrics Born is also pretty funky, boasting a funked up guitar loop. "Burnt Pride" is a pretty sweet cut (and the longest). It features some pretty dirty and complex production (by Lyrics Born). This is Lyrics Born and Lateef at their absolute best. And despite the big name backup (DJ Shadow), Lyrics Born produces most of the album, and provides the musical vision, as well as being the more distinguished emcee of the two. Nevertheless, this is a phenomenal debut for both of these mad talented cats. It is sad that only 14 other fans have reviewed this album besides myself. It will probably never receive the recognition it deserves. It also didn't help that the album was virtually non-existent for the first 5 years of it's release. I'm doing my part to change this, and I implore you to do the same. Because there's only one way to find out about great music like this, besides doing your homework on the internet. And that's word of mouth. Everyone I know is getting a taste of Latyrx, and they're loving it.